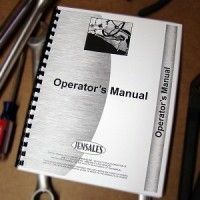 The operators manual (AKA owners manual) came with the tractor. It gives the owner/operator instructions, shift patterns, capacities (anti freeze, crankcase, etc.) and adjustment procedures (brakes, clutch, etc.). This is a critical tool for operating and maintaining your tractor.